There is a phishing email scam doing rounds right now disguised as an order confirmation from Amazon sent to you from customer support. Cybercriminals have widely spammed out an attack via email, posing as Amazon, in an attempt to trick users into handing over their personal details. The Phishing email with varying titles like ‘Item waiting on delivery/You have one message from amazon/Your amazon order has been shipped’ states that an Amazon purchase was shipped and given Order number #002-2735850-54244875 etc and payment details. The phishing email provides a links to view your Orders, do not click on them because the link takes you to a bogus website to trick you into revealing your personal data. The headings claims that the receiver’s order has been complete and that they were successfully charged varying amounts that are often over $100. In the sample we received (see below), Info@Omniquad.com has apparently purchased a Television set and had it delivered to an apartment in the US. Anybody receiving such an email, would naturally wonder, and might click the link and enter their details without thinking it through, especially as the delivery date is the same day as the email is received. 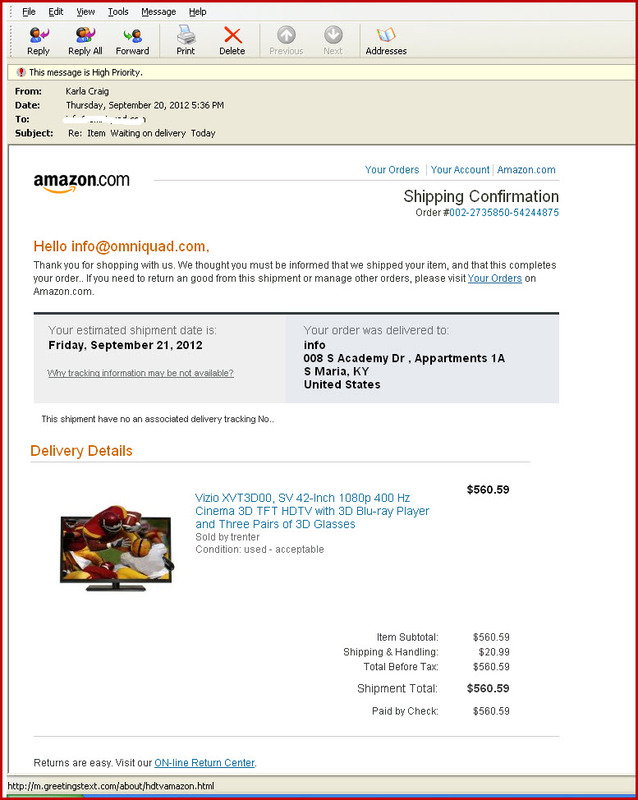 The email appears to be genuine as there is an order summary, a personal email address, an order number, an Amazon advertising banner. At the bottom of each sample we have seen it states “Thanks again for shopping with us” or “We hope to see you again soon” then like a signature says Amazon.com. Claims that your account has been compromised or accessed by un authorized person. Always look for “https://&#8221; and padlock on web sites that require personal information. If you do receive an email from Amazon, or any other online retailer, and you wonder if it is legitimate, it is best to go the their web site the usual way and check your account from there. Omniquad Mailwall Remote detected it as phishing and blocked it from their customers. PS. Tweet if you want to warn others of this scam. Sure! Thank you. It is always nice if people want to share our blog.